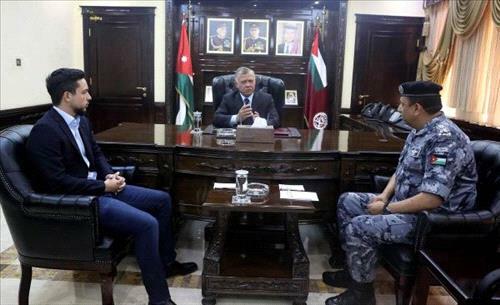 AMMONNEWS - His Majesty King Abdullah II, the Supreme Commander of the Jordan Armed Forces- Arab Army (JAF), Tuesday said that the success of JAF and the security services in thwarting terrorist schemes reflects the professionalism and efficient coordination among various security bodies. The King's remarks came during a visit to the Public Security Department (PSD) and the General Directorate of Gendarmerie. The Supreme Commander said: " There are nothing to worry about with regard to the security of our country now and in the future, as our community rejects the dark extremist ideas held by the Khawarij, (outlaws of Islam)". During his visit, accompanied by the Crown Prince Hussein, the King voiced pride in JAF personnel. His Majesty said Jordan has been and will always be strong, thanks to the unity and the awareness of Jordanians and the great determination of its various security forces. His Majesty also held a meeting with the Gendarmerie Director Maj. Gen. Hussein Hawatmeh, who briefed the King on the latest security developments related to the gendarmerie work. The King commended the advanced level of the Gendarmerie Directorate, especially in preserving security and strengthening the rule of law. King Abdullah also expressed condolences over the death of a number of in the terrorist attacks that targeted the country. Moreover, King Abdullah also visited the PSD, where he met with Director Maj. Gen. Fadel Hmoud, who presented a summary on what has been accomplished within the 2018-2020 strategic security plan. His Majesty reaffirmed his trust and pride in the PSD personnel and their major role in safeguarding the nation’s security and stability. The King and the Crown Prince also toured a preventive security facility and checked on technical equipment which contribute to upgrade the enhance the performance of police. During the visit, King Abdullah also decorated a number of champions of the Police Sports Union, who have won regional and international competitions in boxing and marathon.